Get toned and fit without leaving your home! The new STOTT PILATES SPX Reformer Package facilitates over 250 Pilates exercises, and the two DVDs provide over 90 minutes of detailed and clear instruction to guide you through a studio-quality workout at home. The professional-quality SPX Reformer is durable, versatile and easy to use. It provides a challenging workout for users of all fitness levels and backgrounds. Enjoy the benefits of increased core strength, flexibility, mobility and endurance without stressing the joints. 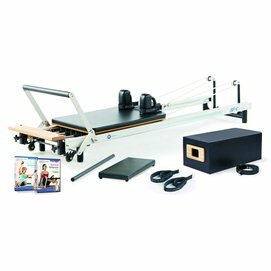 Package includes SPX Reformer, Reformer Box, Padded Platform Extender, Roll Up Pole, 2 DVDs (At Home Reformer Workout and Essential Reformer), and Easy Start Poster Guide.